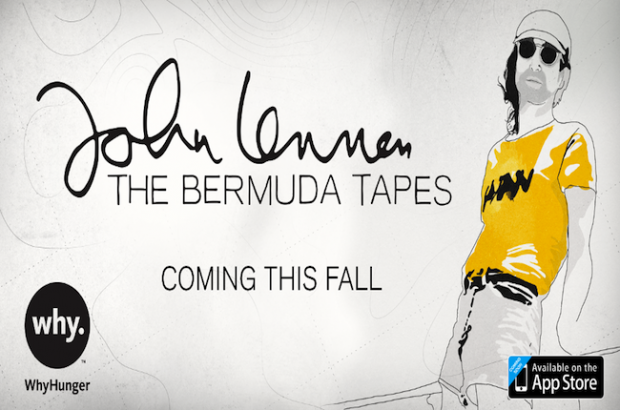 John Lennon’s journey to Bermuda during a storm in June of 1980 has made for a legendary story in musical circles over the years, not least of all because it lead to the so-called “Bermuda Tapes,” a collection of demos recorded on the island as he collaborated remotely with his wife Yoko Ono, who remained at their home in New York. Now, thanks to an upcoming interactive album app, fans of Lennon’s music will be able to take that journey with him even as they support WhyHunger’s “Imagine There’s No Hunger” campaign. All of those adventures, along with the songs that they inspired, will be available to via the app, which will tell the story of Lennon’s travels and songwriting, along with the recording sessions with his wife that later blossomed into the album Double Fantasy. All proceeds from sales of the app, to be available via Apple iTunes for the iPhone and iPad, will be donated to the aforementioned Why Hunger campaign, helping to educate those in need in the ways of agriculture, an initiative that has already provided enough food for 7.2 million meals for needy children in more than 20 countries around the world. John Lennon: The Bermuda Tapes, an app for iPhone and iPad, will be available for purchase on November 5, 2013. Already availablew for free on utube – has been for ages. i just dont get This,,What gives !